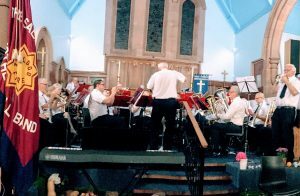 Saturday 13th October Holy Trinity church hosted a Thanksgiving Concert with the Band of the Salvation Army and friends from Motherwell. The Rector welcomed members, friends and neighbours from the community. The Band Master Mr Willie Friend conducted a full programme of music, song, and solo pieces on the theme of thanksgiving. The Salvation Army standard was paraded at the opening of the proceedings. Major David Johnston gave a short reflection on ‘The Pearl of Great price’ in the gospel of Matthew. 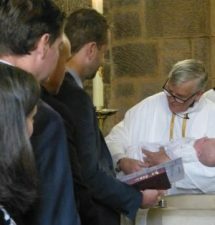 The Rector led the closing prayer and benediction. A supper was provided in the church hall afterwards. The Rector gave thanks and appreciation to all involved for a thoroughly enjoyable evening and presented tokens of thanks to Captain Cheryl Stone for the solo rendering of ‘Amazing Grace’, to Mr Willie Friend for arranging the programme, and to Grace Craig and Chrissie Wilson for organising the hospitality. Donations raised on the evening will go towards church funds.